In order to understand Eric Dollard and therefore Steinmetz and Tesla one must basically learn a new language…a new set of terminology. A lot of the words that conventional physicists and Electrical Engineers use have been REDEFINED by Mr.Dollard so that the vocabulary can be expanded to encompass totally new concepts and ideas. Special thanks to Garrett and Raui for helping explain some of these terms. Writing a new dictionary is complicated and I will update this page periodically when I see clear and concise explanations. This section is incomplete & a work in progress…..there may be contradictions in terms. 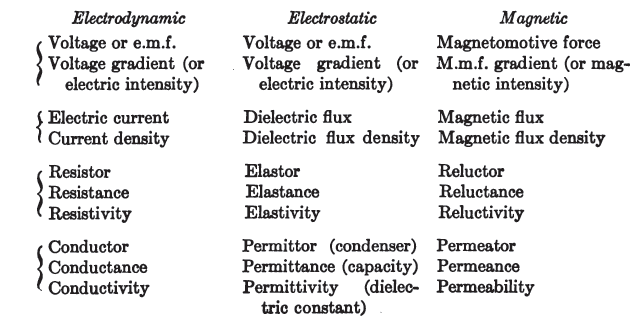 M, Mutual Inductance – Magnetic energy stored in Normal Space. Mutual induction of the magnetic field is that which transfers energy in-between two separate coils, there is no storage of energy here, only the transfer of energy from one distinct coil to another. K, Mutual Capacitance – ALL DIELECTRIC ENERGY IS CONSIDERED AS A COUNTER SPATIAL ENERGY. Thus, the storage of dielectric energy is greater when there is MORE counter space for the energy to occupy. This can be looked at as the RECIPROCAL of SPACE or a “large space” divided into the “unit” (1) is an equally large “counter space”. This is seen in the design of a capacitor, the closer the plates are the more “storage” or “capacity” the capacitor has, it’s that simple. K is when there are multiple C’s that are mutual with one another, or MULTIPLE separate metallic surfaces linked via dielectric flux, this in the secondary is seen in-between turns. Resonance – In physics, resonance is the tendency of a system to oscillate at a greater amplitude at some frequencies than at others. These are known as the system’s resonant frequencies (or resonance frequencies). At these frequencies, even small periodic driving forces can produce large amplitude oscillations, because the system stores vibrational energy. Distributed element model – In electrical engineering, the distributed element model or transmission line model of electrical circuits assumes that the attributes of the circuit (resistance, capacitance, and inductance) are distributed continuously throughout the material of the circuit. This is in contrast to the more common lumped element model, which assumes that these values are lumped into electrical components that are joined by perfectly conducting wires. In the distributed element model, each circuit element is infinitesimally small, and the wires connecting elements are not assumed to be perfect conductors; that is, they have impedance. Unlike the lumped element model, it assumes non-uniform current along each branch and non-uniform voltage along each node. The distributed model is used at high frequencies where the wavelength approaches the physical dimensions of the circuit, making the lumped model inaccurate. 3) Discontinue the practice of habitually exchanging the terms power and energy as if they are equivalent, they are not. Engines are not motors, etc. For anyone who doesn’t quite understand this. Energy maybe conserved but theoretically we can derive an almost infinite power from small amount of energy, remember that it is power that turns out motors, lights our lightbulbs etc etc. Time is where our energy comes from and our circuits are powered by time (in a sense atleast). So you can see that in every joule of energy is the ability to do deliver many watts in our circuit, the factor of consideration is not so much how many energy can be derived from a system but the speed of this exchange which is what we should exploit. I thought I’d pop in and give my two cents on this whole energy, work and power debate, it’s application to power magnification and to help clear up a few things which have been asked. This is just a summary of my current understanding which may or may not be able to help those concerned come to a further understanding of what Eric is trying to say. First of all we’ll go back to our fundamental dimensional relations of the difference between energy, work and power. Energy measured is measured in joules, or plancks per second where the Planck was defined by Eric as being of dimensions joule-seconds. Energy is an implied quantity which is only of interest when conditions in a system are changing. If something in our universe changes in any way energy must be equally exchanged between it’s various forms (electromagnetic, kinetic, etc.) as to remain a constant quantity as per the Law of the Conservation of Energy or for the Mr Heaviside’s out there – ‘The Law of the Continuity of Energy’. When something changes and energy is exchanged there are two more quantities we can talk about and they are work and power. Work is also measured in Joules and is the difference in the energy magnitude from before the system changed to after the system changed. It should be noted that here we have 2 quantities, being energy and work, which have the same dimesions of Joules but represent two slightly different things which is a theme which pops up in the work of Mr Dollard (E,e,I,i being an example). Power is measured in Watts, Joules per second or Plancks per second per second as per Dollard’s units. Power and work are very closely related in that power is measured as the work per second. So basically when the level of energy changes within a system the magnitude of the change is the work and the rapidity of the change is the power. Since we started off with a totally uncharged capacitor (v=0 so E=0) we have done 72-0=72 Joules of work. It should be noted that if the capacitor was charged to any non-zero voltage our values of work and energy wouldn’t be equal and so here we have a case of two quantities with the same dimensions having two different meanings for if they had the same meaning they would be equivilent at all times. So in charging our capacitor of 1 Farad through a 1k resistor to 12 volts we get 0.0144 Watts of electrical activity. Now let’s disconnect but not discharge the capacitor and connect it to a separate circuit so that the capacitor discharges into a 10 ohm resistor. Plugging 10 ohms into equation 6 gives 1.44 Watts discharge. The energy stored in the capacitor on charging is the same amount of energy released by the capacitor on discharging, use the above equations to prove this for yourself if don’t wish to take my word for it. “I’ll utilize an analogy to help explain what Eric is talking about. the Insulator Psi and the Conductor Phi. If I ‘shocked’ you using a condenser (capacitor) then the electro-static volts would be e and the ampere current displacement would be I. So the aim of our game is to change the parameters of our circuit as quickly as we can to create/cohere energy and if this energy gain is higher than the resistive losses plus the energy required to change the parameter we have excess energy we can use to power a load! work and Steinmetz’s work is in CGS units. transmitted through time. This is a very intgeresting topic. “The exact same condition exists today with regard to radio and the more generalized wireless, except with a less favorable outcome. As shown by the Heaviside in his electrical equations and further developed by myself in the tradition of Steinmetz, wireless transmission can be shown to involve a conjugate pair of propagations, the electromagnetic and the magneto-dielectric. 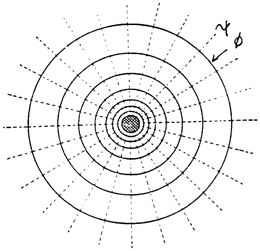 Electro-magnetism and the adulteration of its theories by Einstein and the like has become the accepted element of the propagation of electric forces. The conjugate magneto—dielectricity, and the brilliant presentation of its dimensionality by Rudolf Steiner and his followers is denied by the corporate cable institutes. But, as with the cable long distance case, electricity plays no favorites, and radio transmission suffers from analogous distortions. The archetype of conjugate pairs exists everywhere, however, and some examples will illustrate. 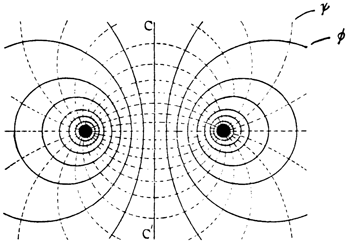 “Magnetic Inductance is thus a dimensional relation for the magnetic properties of the Aether, and Dielectric Capacitance is thus a dimensional relation for the dielectric properties of the Aether. Inductance and Capacitance are thus the application of metrical dimensional relations to certain characteristics of the Aether.